There are four herbs and spices that I recommend to incorporate in your daily diet so that you can get the natural and healthy benefits along with their very aromatic flavor in your meals. 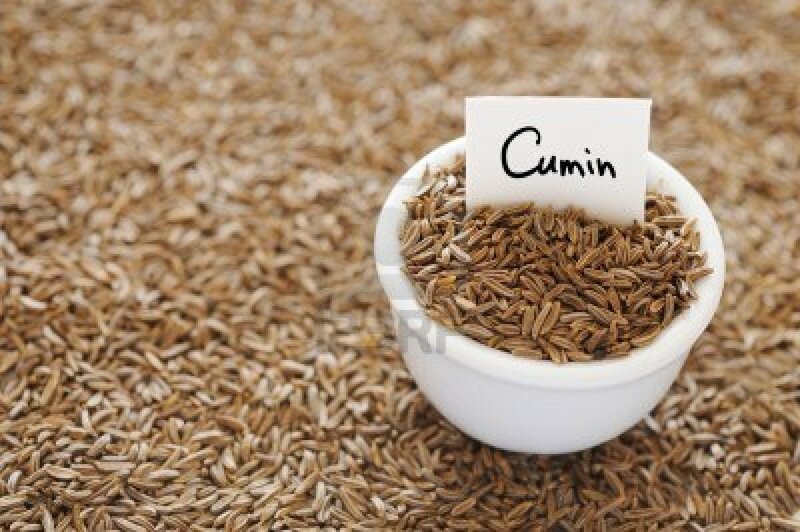 Cumin is a native of Turkestan. Currently, it is widely used in India, Turkey, the North African Arab countries and the countries of Eastern Europe. Today, it is used as a culinary spice and as a medicine in the Arab and Mediterranean cuisines. It is used in dishes like vegetables, soups, breads, fish, poultry, cheese, etc. It has carminative powers it is good for flatulence. Cumin’s essential oil has appetizer power and used as stomach tonic and facilitates intestinal transit, diarrhea and nervous dyspepsia. The root of the ginger has a brown tender skin and has many knots. Sometimes the whole piece is called root. The pieces have to be thick, full and smooth, firm and strong skin. Fresh ginger can be stored loosely wrapped in foil in the bottom of the refrigerator for up to three weeks or in freezer up to one year. When you need it, grate and put back the root in the freezer or refrigerator. Another way to preserve it is cutting into slices, placed in a glass jar and covering it with dry sherry or olive oil. Thus, it is kept up to a year in the refrigerator. Fresh ginger is irreplaceable in oriental dishes. In Chinese cuisine, it is peeled and cut into thin slices or strips and heated in the oil for giving aroma and taste to meals. It is also placed on the meat or fish before steaming or sauté. Mint grows in most of the climates, but the favorable one is moist soil and some can be in the sun but preferred to be under semi-shade. It belongs to the family of Labiatae. It can measure up to 80 cm. Its leaves are oval, stalked and toothed. Its stems are straight and have hair. It is used to flavor foods such as beans, eggplants, cucumbers, peas, tomatoes, meat, potatoes, grilled fish, and for dressing and seasoning sauces. It is widely used in Chinese, Indian, Iranian and Vietnamese cooking. Paprika is a kind of pepper and has many varieties in form of dry mixtures. Paprika is often associated with Hungary and has a common place in Hungarian cuisine. Commercial food manufacturers use paprika for color. Paprika releases its color and flavor when heated. Therefore, spreading ground paprika over colorless dishes can improve their appearance, but do it in little quantity as it is very spicy in taste. If you want to color the ingredients of a dish, you can mix paprika in a little hot oil before adding. Cooking with herbs and spices is tasty as well as a healthy practice and it turns out be economical too as it saves you money on doctor’s visits too.